Last time, we looked at Radune the Dragon, who could transform into everything from an inside-out insect to maybe one or two things that almost look like a dragon, and we reviewed each and every last one of them. 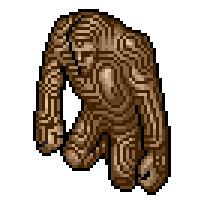 Today, we check out the equally peculiar forms of Dhalzam the Golem! 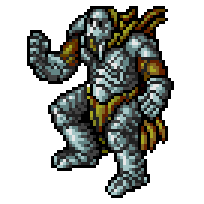 Dhalzam's basic form is exactly what you expect from a fantasy game "golem," a humanoid guy made out of rocks. 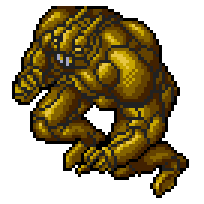 Of course the original golem is a Jewish creation and composed of clay, but fantasy gaming decided at some point that they're just made of whatever. Outrageousness right off the bat! 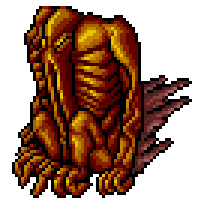 Remember that every transformation in this game is brought about by eating a willing human volunteer. 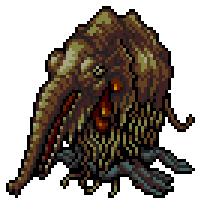 The image of a rock man devouring an entire person is pretty freaking weird, but not as weird as this monster whose name means "A VICIOUS MASK." What mask? I see a veiny fleshy being with a long, vertical slot for a mouth, closed eyes and a split cranium. Those wiggly little toes are pretty interesting too, and whatever that purple, tattered material is trailing behind it. Is that attached to the arms or what? What am I seeing? What a fun little thing! 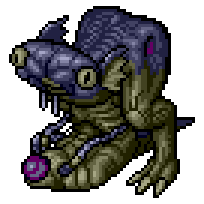 It's got a fat, rocky piggy-frog body, a huge rugged beak, and cool glassy bubble eyeballs that read to me as the eyes of something that definitely lives in perpetual near-darkness. That is a rock-crushing, tunnel-digging beak if I've ever seen one. 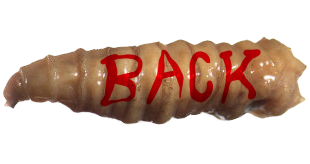 "Bugmare?" 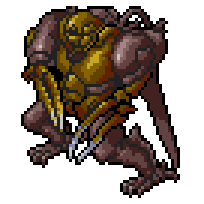 Is this some sort of corruption of "bugbear?" 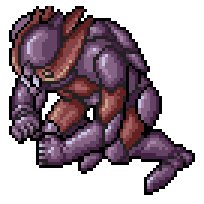 I can't tell if I'm seeing some kind of humanoid in shiny armor or if they're really supposed to have an organic exoskeleton with little insect legs sticking out. Whatever this one is, it's covered in green warts and it has bright purple tentacles. 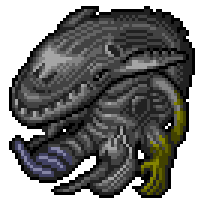 I don't think you can ever go wrong with that combination of elements, though it's always the face that really makes or breaks a monster for me. I'm going to say Cholisorg has a fairly acceptable face, even if I can't tell exactly how it's meant to be structured. Wow, this is a weirdo. No apparent mouth or other obvious facial features, except what MAY be little slot-like eyes on its two boomerang-shaped horns. Nice! 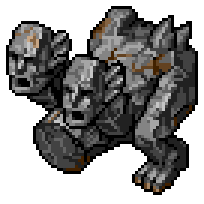 I like a golem being able to evolve into a stony gargoyle. Nothing remarkable about the design, but gargoyles are pretty cool, honestly. 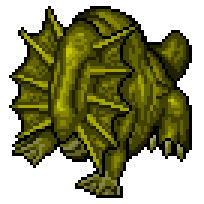 I think they're really under-appreciated as monsters. 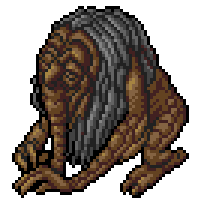 I almost want to say this creature defies all description, but describing a creature is a challenge I will never back down from. 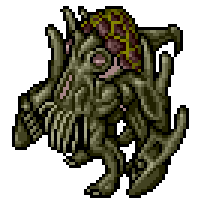 The head of this thing, which is also most of its body, looks to me like a fusion of hippopotamus and cat flea, while the rest has a sort of feels like a biological, humanoid airplane man, and it's all topped off with a giant fungus brain. There. I described what a DOGIRIYARD looks like, and my soul can rest in peace. Did I mention how much I love these kinds of surreal names? 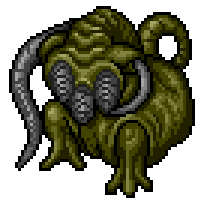 "Earth Chamber" is just some sort of biotechnical-looking humanoid with an alien bubble head, but that name fills me with a sense of deeper intrigue. 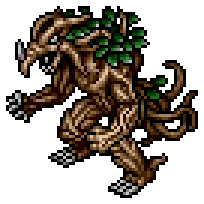 I caught on to these kinds of weird names as a kid, when I used to play a lot of JRPG's, and for a while I tried to come up with similar word salads for my own monsters. 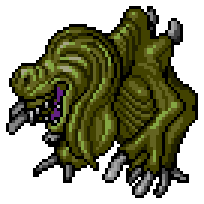 The only one I can remember, and I might have possibly talked about this before, was some sort of clawed, fanged reptilian thing that I named "Minnowlost." I still think that has a nice ring to it. I think Minnowlost and Earth Chamber would be friends. 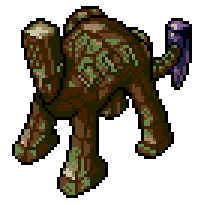 We finally have one with a descriptive name, except that there's an awful lot more going on here than just an elephant. 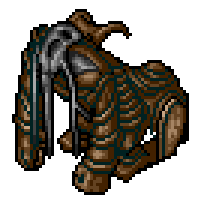 The pachyderm seems more like a half-melted hide being worn by a giat pile of spaghetti with blue flippers. 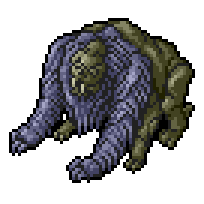 A half-rocky, half-shaggy sort of ape-lion beast with prominent tusks. Not my kind of weirdo, but I like it! It even actually looks like it evolved from a rock man! Wow, really unique! 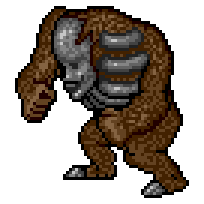 This is another that truly resembles a mutated golem, but REALLY REALLY mutated. 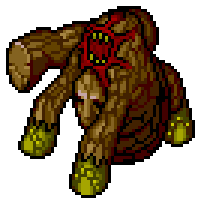 A big craggy rock with mossy hooves, a fleshy maw above its crudely humanlike face, and an additional appendage armed with a big, giant mallet. 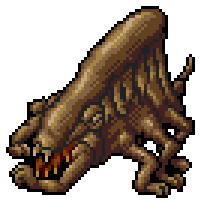 It doesn't look agile enough to make great use of that thing, but it's probably one of those monsters that gets a running start in a straight line and just smashes its way through everything in its path. I love saying that name. FAULTMORKE! Say it out loud! I don't know if the end is supposed to sound like "mork" or "mork-ayy" but either one is good. 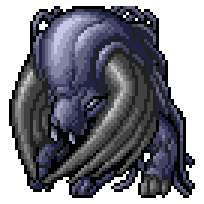 This is another one that reminds me of a monstrous flea, somehow, but I guess I just sea fleas in everything. Very cool scissor-like limbs! Something makes me think this veiny reptile is a desert creature. It is the big, blue, leathery back that kind of looks like a camel's hump? Am I that shallow?? Just because Felustra has a hump shouldn't necessarily mean it lives in a desert, I know that. It could just as easily be amphibious. Straight to the point, nothing confusing or abstract here; Dhalzam just changes from rock to flesh and becomes fleshdoll! Love those ornate wrinkles, though, that is a really cool and creepy texture for something presumably made of skin. Okay, this HAS to be amphibious. It's got webby feet in the front! The head is also an interestingly elongated, eyeless affair with prominent frills down its sides. 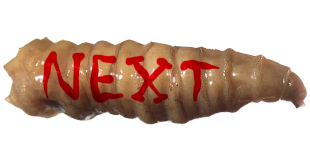 Wow, I love how nasty this thing is! 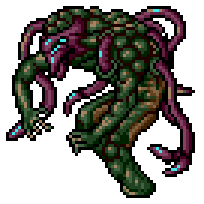 Its wrinkled, corpse-green flesh is practically sagging from its skeleton, more folds hanging off its oversized rat-dog face with a delightfully ghastly, gummy grin...and its name is just GOSHK! This feels like a monster that probably stinks. Badly. And probably gnashes old, dead bodies in a pit somewhere. There's something mighty unsettling about Goslott. It's kind of like an embryo that kept growing all wrong into more of a big cyst, and only its front limbs developed enough to function. 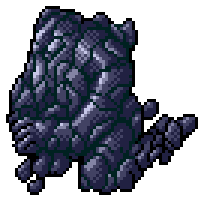 Well, it's certainly a grainy and rocky golem. This should be cooler than I feel it is, but the big giant brick looks hilariously cumbersome, and I'm sure it's supposed to look more alien than that, but I can't help seeing a tiny little humanlike face with a big long buzz cut. 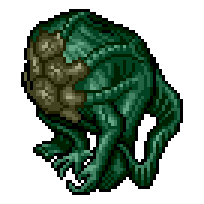 This is some sort of slimy green quadruped with a tail, but instead of a head or face, it has a weird cluster of brown warty nodules, fused into its flesh by a webbing of segmented tubes. This is one that really feels like it's supposed to have an explanation or backstory. Greutles!!! An adorable name for an adorable monster! Well, kind of adorable. 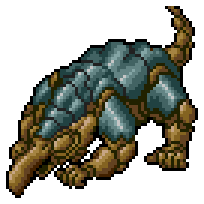 It has a sort of one-eyed bug hanging off its stomach, while its oblong head is sort of between a salamander and a squashed cat. 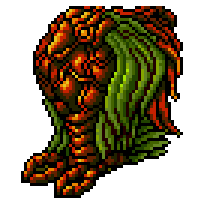 A fairly spooky human-faced beast that makes me think of a wingless sphinx, though the red and green hair looks like some kind of symbiotic moss. Not bad, but not great. 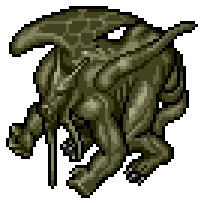 A fairly mundane entry in what we've seen so far, but I like that its face is so buglike, at least. What kind of a name is that?! And it looks like a sad cross between E.T. and a deflated sloth. Good. I like Hippollottamacaroni. Another plain one, but I do like the cool blue color, and simply being named "IMMORTAL" is pretty ominous. 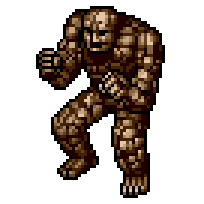 Okay, but this is the plainest looking golem, and it scrapes by just on having another cool quasi-nonsense name. Awwwww. Look at this sad baby! Like a woolly mammoth that's also a pig and a tapir and a filthy wet dog. 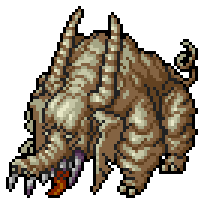 This is another one that looks like it stinks, but it doesn't look half as menacing as Goshk. It really looks like it just wants a nap. JUBARG! 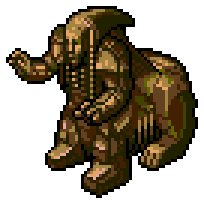 This is just a golem with a dinosaur head?! Well, okay. I'm sure lots of people are into that. 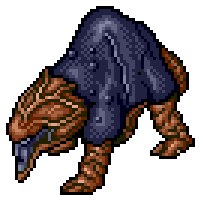 This armor-plated beast would be more menacing if it didn't have that hilarious big nose on it. It's like those old Looney Tunes caricatures of Jimmy Durante. I look at Kezzentridart and I hear a cartoon voice doing that "Ha-cha-cha-cha!" thing. You know the thing, right?? I'm not so old that I'm the only one here who remembers when Cartoon Network actually played Looney Tunes, am I?? I don't know what Langby is, but I'm proud of this scuttling alien head for becoming its king. Okay, THIS is my favorite nonsense name, especially for what looks like a cross between a parrot and a disembodied heart! Man that's neat! 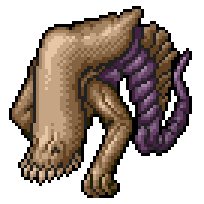 So, this one...is kind of like an emaciated dog, crossed with an earwig, with a head like the Space Jockey from Alien, or I guess like what we thought the Space Jockey looked like before it turned out to just look like a dude. I actually liked Prometheus, but that was really disappointing. All these freaks and weirdos we've seen, rotten dog squids and dinosaur rocks and meat blobs with names like Doomy Gazebo and whatever...and then there's just Marble Head Boxer, a purple guy who I guess is a boxer. Mater is another really cool one! 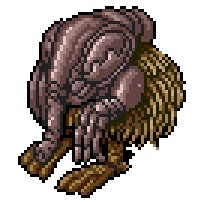 A sort of giant weevil head with big, segmented hands, a shaggy round body and bird feet. Just plain fun! 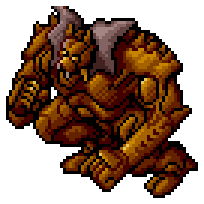 You know, I can't think of any other monster or character whose name has ever emphasized its "shoulder." 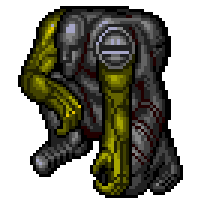 That is a pretty decent quality shoulder I suppose, but is it really the most memorable part of this guy? That's honestly a little sad. I feel bad for him. A really cool thing! 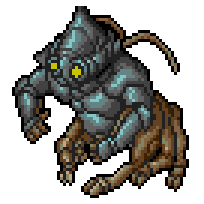 Its got a pointed helmet head and round, glowing eyes that kind of evoke the Flatwoods Monster, while the rest is sort of a bug-centaur with multiple hoofed legs. A very distinctive design! Another really funny name to say, and for a mighty peculiar four-legged rock monster. 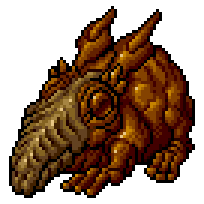 Its face has kind of a serene, mystical idol feel to it, but on a more animal-like body with some kind of little hammer tail. This is basically a mutant whale with hands, and a curled up "tail" I can't help but reading as some sort of genitalia. Sorry, Nukslim. You look like a whale with its dork out. Eerie! 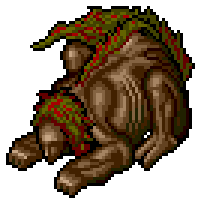 Like a hunched, scaly troll with a drooping proboscis. The face is juuuust humanlike enough, before it gets to the proboscis, to hit a nice creepy spot. Another creepy one! A REALLY creepy one! The face is like a porcelain doll with a big, bulbous forehead and smiling lips, and that's just so unpleasant on a burly, shaggy, apelike body. 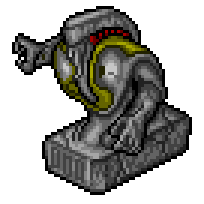 Our second rock beast with a "battering ram" element. Not as strange as the first example, but it has an interesting enough overall arrangement. 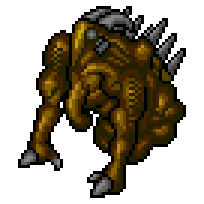 Another of After Armageddon's more nondescript thingamabob sort of monsters. Those three grey, wrinkly nodules could be multiple heads, but they don't have any facial features to speak of. I like the asymmetrical horns, or tentacles, or whatever they are. Whatever the hell this is, it's damn badass, isn't it? 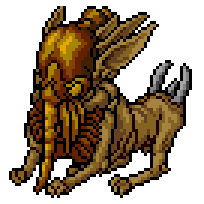 It's another that makes me think of a "sphinx," with more animal-like hind limbs and humanoid forearms, ornately decorated in those greenish ridges with a cool as hell bony, eyeless head and a needle-like proboscis. It all just combines into such a radical overall design. Oh. Okay. 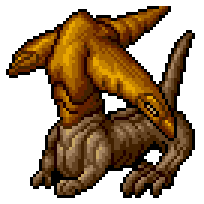 I've described two other monsters here as sphinxes, but there's already just a sphinx called sphinx. Not bad, kind of obligatory. Oh my god. 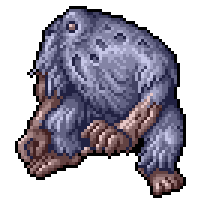 I love the look of this simple, spooky cyclops yeti as it is, but they had to go and give it a name like STONE COLD HAIR. What name could ever possibly better for not only a yeti, but a yeti that USED to be a rock golem?! I don't usually say this kind of thing, but this one REALLY looks like a dong monster. A floppy dong monster. That's okay, though. That's completely valid! It also has rad teeth and an even radder tail! Very peculiar. 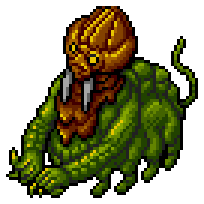 A globby, scaly green thing with a funny little alien head, walrus tusks, and a neck like melted wax. 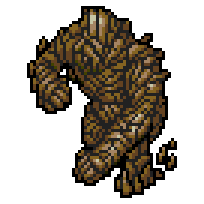 This is one of the four "ultimate" golems! I'm not sure why that would be an anthropomorphic reptile made out of plant matter, but hey, whatever! I guess that's kind of "ultimate golem-y" enough! The next "ultimate" is pretty dull, honestly. 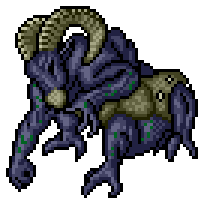 Just a ram headed demon with extra legs? You could have been so much more, Capuunreik! 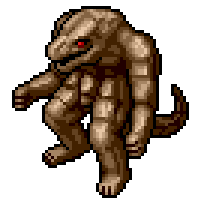 So this ultragolem is kind of...reptilian? Again? 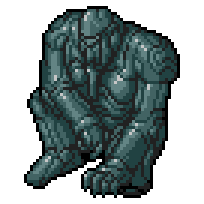 But heavily armor plated. Pretty cool. 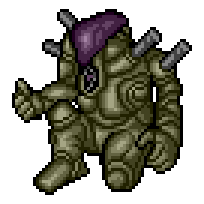 The purple blades on its head nicely break up the monotony of its rust-colored exoskeleton and it definitely has a powerful, important look to it. 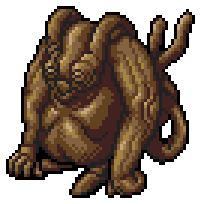 This bulbous, alien bison-thing with rows of almost rib-like horns is very, very neat, to be sure, but it means that the four ultimate golems are four of the least bizarre and intimidating of the bunch. At least we got to see STONE COLD HAIR.